A half pallet is one that comprises half the footprint (length x width) of a conventional pallet. Half pallets, along with quarter pallets and one-eighth pallets are also sometimes referred to as fractional or modular pallets. In North America, for example, where the 48×40-inch pallet is standard, half pallets are typically 40×24-inch or 48×20-inch. In mainland Europe, where the most popular pallet is the 800×1200 mm EUR 1, the 800×600 mm EPAL 6 and 7 half pallets have carved niches. Half pallets are offered by several pallet rental providers in North America and Europe. Shuert Technologies plastic half pallet shown above. The half pallet offers a range of benefits in the right application. Less touch labor. Half pallets permit the benefits of unit load shipping in smaller order quantities. Unit load shipment from a distribution center to the retailer translates into less touch labor at the distribution center. Likewise, where the half pallet is displayed on the floor or positioned in-aisle, stocking work can be largely eliminated. More uniformity and efficiency. Half pallets can offer a second standard size, translating into greater efficiency for operators requiring a smaller size pallet versus allowing the introduction of various sized custom small pallets. Less product damage. According to CHEP, 80% of product damage in the FMCG supply chain takes place between the distribution center and retail. To the extent that half pallet unit loads remain intact until they arrive at retail, product damage associated with distribution case picking, shipment to the store and retail stocking can be avoided. Sales boost. Evidence suggests that floor displays help increase sales. Half pallets allow retailers to increase the number of SKUs featured in store displays while reducing the amount of inventory required in comparison to full pallet displays. Easier navigation. Half pallets are better suited for delivering product through narrow doorways, or in and out of backroom coolers with small openings. They are also more convenient to navigate through congested retail aisles. Better suit the size of the product. Half pallets can also better fit the size of the product being shipped to eliminate needless underhang and wasted space. Possibly increase trailer utilization. The loading of half pallets can help shippers better utilize otherwise empty voids in the back of trailers. Less efficient. Half pallets hold only half as much product as full-size pallets, requiring more unit loads to be moved to deal with the same amount of product. They add complexity. Half pallets can be more unstable than full pallets, requiring special material handling equipment. 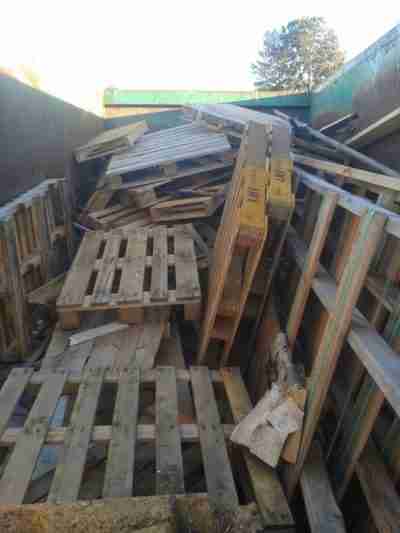 Once emptied, half pallets must be sorted for return or otherwise recycled. Reduction in cube efficiency and increased pallet cost. Some half pallets, particularly 48×20-inch models, arrive at the distribution center doubled up on a full-size pallet, adding extra pallet cost and height to half pallet unit loads. An inefficient approach, random sized pallets are gathered in a bin to be sent for wood grinding. Half pallets are offered by various pools around the world. One of the earliest versions (48×20-inch) was offered by the now defunct Canadian Pallet Council (CPC). CHEP Canada also offers a 48×20 in Canada, as does PECO. The CHEP US half, introduced in 2014, is 40×24-inch. At the time of the launch, CHEP reported it was already issuing over 100 million half pallets annually in its global operations. EPAL offers its EPAL 6 800×600 mm half pallet with timber blocks and its similarly sized EPAL 7 with steel vertical spacers. Half pallets of various styles are provided by other pools, including LPR, IPP Logipal, Svenska Retursystem, NLP and more. Pooled half pallets provide a much needed standard size for small pallets which can improve supply chain efficiencies. When emptied, the return of pooled half pallets eliminates the potential disposal issues or return complications associated with custom vendor pallets. The introduction of half pallets has resulted in handling problems due to a combination of handling inexperience and not having material handling equipment appropriate for handling smaller pallets. I have seen the practice, for example, of balancing half or quarter pallets on one fork when repositioning them, which is not a best practice. Under fork position, the (OSHA) rules note that the operator should remain aware of conditions contributing to the possibility of tipping over, dropping the load and collision. Under requirements and recommended practices, the guidance states, “Center the weight of the load between the forks. Adjust the forks to distribute the weight evenly.” However, the OSHA rules do not explicitly state whether a load can be handled safely with the use of a single tine. Many fork lift manufacturers offer adjustable tines or attachments such as single-double attachments that allow for greater flexibility in handling pallets of various sizes. Safe lifting practices and training may also need to be established to help to identify unsafe situations and to propose safer alternatives. In the end, load stability is a critical component of maintaining material handling efficiency, effecitveness and safety. 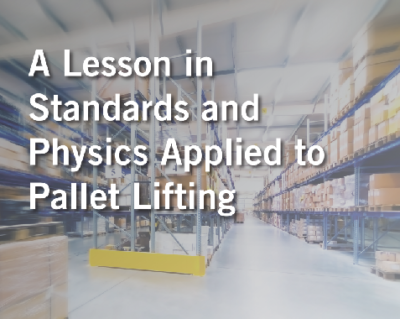 As pallets of varying sizes become increasingly common, we must realize that the utilization of fundamental principles of physics and gravity win out over past practices or convenience. The emergence of mobile equipment designed with small pallets in mind will help improve the safety of handling small pallets. Such pallet movers, both powered and manual, are available from some vendors, including Jungheinrich. Having a standard full pallet footprint helps improve supply chain efficiencies regarding cube utilization, the development of automated systems and more. Smaller standard sizes such as the half pallet and quarter pallet, however, can play important roles in improving efficiencies in specific applications. It is safe to assume that half pallets will gain increased traction for some applications as outlined earlier in this article.